Since I got my smallholding a little over a year ago I have been very confused to whether I have been doing the right thing. The place was very cheap, but requires quite a lot of repairs which I am not awfully motivated to do. In hindsight though I can see that getting a fixed place was the right thing to do since I started relying more and more on my parents as my gear started failing during the second year of my outdoors living. Transition clothing is the greatest issue I feel. Dry weather clothing is relatively straight forward, summer as winter. But during winter thaws and great portions of the spring and autumn life can be truely miserable without a solution on how to stay dry when out and about. Subsistence in this area requires a lot of moving about because of a relatively thin population of game. The ground is rocky and boggy so buckskin footwear doesn’t last long. Rawhide shoes haven’t provided me with the needed warmth. 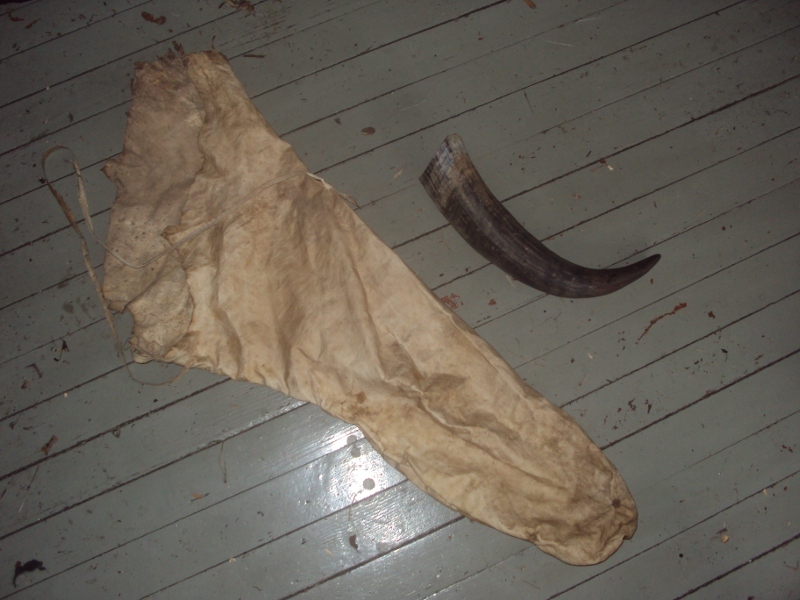 So currently I am looking into traditional Saami footwear. They live in areas relatively similar to here in most regards so I’d expect their bark tanned shoes to work better. If anyone has suggestions to what could work, I’d be very grateful. While the skins are under way, I am experimenting with a number of other things. 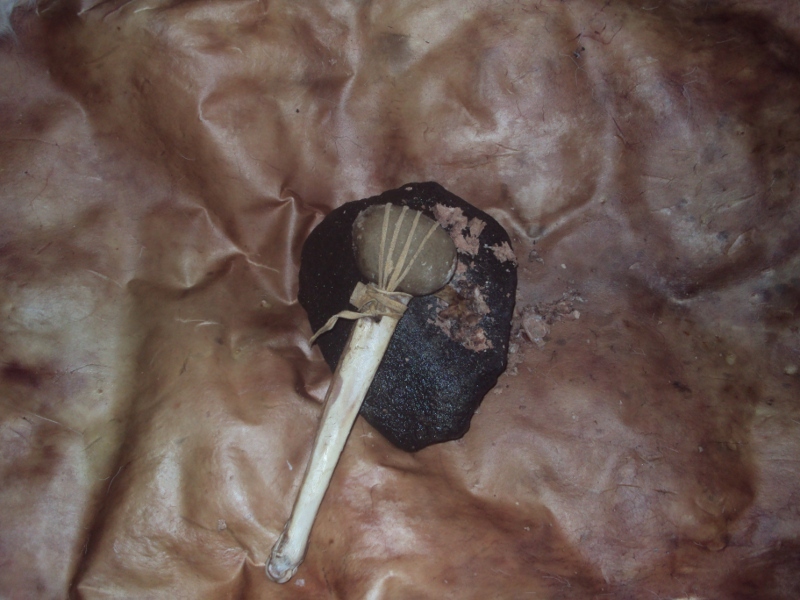 I try to learn from the poor people of the boreal region, since I don’t consider myself as being a good enough hunter to go for the rich man’s solutions… I’ve made a bone hammer to smash the bones (particularily vertebrae and pelvis) and boil out the fat in them. There is a remarkable amount of high quality fat in these bones. I have started saving all the bones from every roasted or boiled meal for this purpose. Another thing I have looked into is bark. Wych Elm (Ulmus glabra) bark, both dried and roasted left a bit to be desired for me I must say, I have a method for making syrup from the bark. 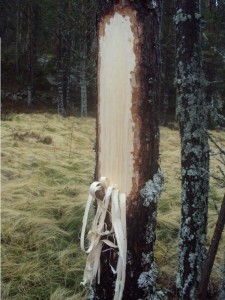 This method is far better since it also saves the bark which in turn can be made into pretty good string. I might post about this method after I have done some refinements on it. Having seen the usefulness of Thomas’ gathering bag and I always find something which I’d like to bring home when I am out hunting I decided to make a gathering bag similar to his. It’s a fairly simple affair made out of grain on reindeer buckskin with a light willow bark tan. The other implement in the photo is a virtually unmodified cowhorn, I have only sharpened the edges a bit. This will serve as a sap scraper. I remember as a kid we sometimes in the spring used to fell aspen trees to eat the sap under the bark. Appearantly we weren’t the first to think of that and I found some horns in an online museum which were labled to be for such a purpose. In my family I’m the only one who cares for skinning beavers properly, although most of us seem to care for eating them. So I do it in return for their skins. The method I use is of native American origin. It’s a bone chisel. As long as the chisel is sharp this method is far superior to a knife in my opinion, leaving a perfect skin and a perfect carcass. And finally, although I don’t have any pictures of it in action, is an arrow planer of Fenno-Ugrian origin. 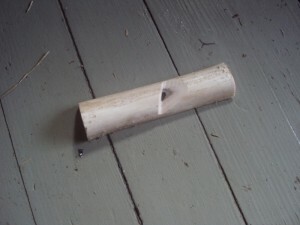 It’s made of bone and is simply used with your regular hunting knife to shave down arrow shafts. Works better than I expected. Unfortunately I don’t have any photos from Thomas’ stay, but I think he has quite a few that he might post. My camera had died during that time, but has now miraculously resurrected itself.